Man of Rubber was founded by husband and wife Gary and Beth Harper. We are a full service wholesale and retail supplier of river gear and related outdoors products for the commercial outfitting industry and paddling enthusiasts. We got our start in the river business over 30 years ago and have worked just about every job imaginable including outfitter owner, guide, trip leader, river photographer, equipment manager, reservation manager, business manager, you name it… on the Class III-IV Ocoee River in Southeast Tennessee. We have spent over 30 years in the river business because we love rivers and river people. We also enjoy helping others, whether it is making your private river trip the best it can be or helping our outfitter clients & friends be as successful & profitable as they can be. We’re ready to put our knowledge and experience to work for you! With over 30 years of river-running experience including over 10 years working in and managing outfitter businesses in each key operations areas such as retail, finance, guiding, scheduling, operations, reservations, equipment repair, Man of Rubber co-founders Beth and Gary Harper understand the need to deliver high quality and durable gear that will hold up to years of commercial whitewater use. You can find cheaper gear elsewhere… but you can’t find better gear anywhere. See below for a few key moments in our time line. The Ocoee River starts running daily for first time in 64 years. The wooden diversion flume on the Ocoee River, TN is condemned & shut down for repairs in the fall of 1976, returning 1400 CFS (cubic feet of water per second) to the riverbed on a daily basis for the first time since the completion of the flume & powerhouse in 1912. Gary’s first rafting trip down the Ocoee River. 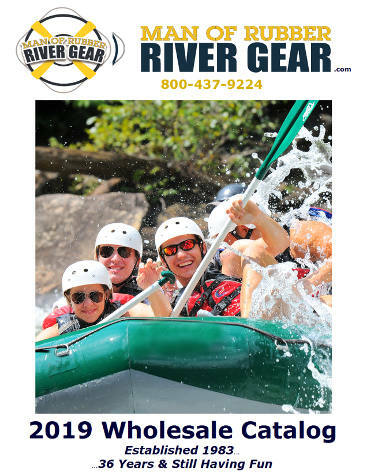 Gary and 3 friends start Ocoee Outdoors the first commercial rafting outfitter to open a shop on the Ocoee River in Tennessee, (Sunburst was the first outfitter to take paying guests down the river a few months earlier). He was guiding paying customers on his 3rd trip down the river, just call it intensive OJT. All goes well until he & his partner James AND the two guests all get dumped out of the boat & swim at Hells Hole Rapid. Starting out, they couldn’t afford boats with cross tubes (thwarts) so staying in the boat was quite a challenge. Photo at right shows their first boat with real thwarts… they bought rolls of Hypalon roofing material and glued it to the bottom of the boats for reinforcement (white material in photo). Gary gives names to many of the rapids on the Middle Section of the Ocoee River including: Gonzo Shoals, Second Helping, Moon Chute, The Doldrums, Diamond Splitter, Western Flyer, Torpedo, and others). He named the put-in rapid on the Ocoee Snow White and Seven Dwarfs with the dam at the put-in being Snow White. The Seven Dwarfs were a series of “sections” or moves that had to be negotiated in order to run the rapid. The original order of the Dwarfs was Bashful, Sleepy, Grumpy, Dopey, Doc, Sneezy and Happy. These days, folks just call the whole thing Grumpy since that ledge is the toughest part of the entrance rapid. During that first season, Ocoee Outdoors is the only outfitter willing to launch above Grumpy at the base of the dam. They didn’t want to cut anyone short on excitement. Gary attends his first whitewater industry trade show as an outfitter, the Eastern Professional River Outfitters Convention in Asheville, NC that Autumn. Gary meets Beth on a blind date on April 26, 1978. Gary takes Beth down the Ocoee on their second date and she is hooked on the River, and Gary. Gary becomes the first person to row a raft down the Ocoee River. He rows a 12 foot Campways Hopi using 6′ wooden oars… he quickly realizes the importance & utility of longer, stronger oars & builds a homemade wooden rowing frame and buys some stronger Carlisle oars (shown at right). In September, Gary & Beth travel to West Virginia to run the Gauley River for the first time. This becomes the first of many Autumns that they travel north to paddle and row private trips on the Upper & Lower Gauley. Gary attends his second whitewater industry trade show as an outfitter, the Eastern Professional River Outfitters Convention at Hidden Valley Ski Resort, PA.
Gary attends his third whitewater industry trade show as an outfitter, the Eastern Professional River Outfitters Convention in Richmond, VA.
Gary sells his ownership stake in Ocoee Outdoors to Val Cox (later the founder of Val’s Cripple Creek Expeditions on the Ocoee) and he and Beth become guides, trip leaders and later managers for Sunburst Adventures. Beth runs reservations, retail, business management, river guide and trip leader. Gary becomes equipment manager, river photographer, general handyman, river guide & trip leader. They learn every aspect of running an outfitting company over the next four years. Gary & Beth buy a used 18′ Rubber Fabricators “Green River Model” raft to row on eastern and western river trips over the next 10 years. In July Gary & Beth have their first western river trip and row their 18′ gear boat down the Middle Fork of the Salmon in Idaho. They provide gear support for a group of boaters from St. Louis who are members of the Missouri Whitewater Club. Gary rows the Lower Canyons of Rio Grande, the most remote locale in the 48 states. Over the next few years, Gary and Beth manage equipment & on-river logistics and row week long trips on the Lower Canyons of the Rio Grande for The Baylor School of Chattanooga TN’s Walkabout Program. In October, Gary rows his first trip down the Colorado River through Grand Canyon. He rows 270 miles in a 14 ft Avon Ranger. He claims that he was too scared to flip. Ocoee River TN Flume Line rebuild is finally completed and the rafting outfitters sign an agreement with TVA for regular water releases for recreation. Gary opens his own raft repair business as outgrowth of his equipment manager job and calls the company “Man of Rubber” because it is a name no one will forget. Gary & Beth become the eastern US sales reps for Domar Riverboats, which were made in northern Italy. Beth & Gary see their first Chums Eyeglass Retainers while working their yearly Grand Canyon trip. Chums becomes Man of Rubber’s second product line, and Man of Rubber is Chum’s first sales rep.
Man of Rubber attends its first trade show as a vendor, the Eastern Professional River Outfitters show in Daytona Beach as the east coast sales rep for Domar Riverboats & Chums Eyeglass Retainers. Gary works for OARS as a paid boatman in Grand Canyon while Beth works much harder as a baggage boatman. Man of Rubber designs riverboats specifically for eastern rivers, and Gary & Beth travel to Italy to finalize designs at the Domar factory near Lake Como. Man of Rubber adds more lines of river gear to its growing distribution business. Long frustrated with traditional waterproof bags, Gary designs and creates a new line of waterproof drybags with an innovative duffel shape that utilizes an industrial zip lock type closure. If you look around on the rivers of the world, you will still find some of those famous Man of Rubber Zip-Lock Dry Bags still going strong over 20 years later. Eastern Professional River Outfitters (EPRO) and the Western River Guides Association (WRGA) decide to merge to create a new organization, America Outdoors and they hold the first joint conference in New Orleans. Of course Gary & Beth are there selling River Gear..
Gary and Beth decide to leave manufacturing and return to their love, which is sales and service to river people. MoR sells the dry bag manufacturing business to their best employee, Eric Revels. Eric still manufactures the drybags, under the name “Watershed” and you can find him at www.DryBags.com. Beth is elected the Vendor Representative on the Board of Directors of America Outdoors and serves for the next ten years. Whitewater Slalom included in 1996 Olympics and a Whitewater Center and course is built on the Upper Ocoee River, TN. Man of Rubber becomes the exclusive North American distributor for Leafield Marine, manufacturers of the famous Leafield Valves that are used in over 90% of today’s riverboats. Gary does his first motor supported trip on the Colorado River in Grand Canyon and serves as a stunt extra in the film version of Writing Down The River…. oh yes, did we mention the flip in the 13′ paddle raft in Hermit Rapid? Jeanie Jackson joins MoR as sales and service specialist. Beth forms Merchandising Magic to consult with outfitters on how to make their stores more profitable. Gary works another motor trip in Grand Canyon as swamper and has a nice run driving the 37′ rig through Granate Rapid and others. Jeannie Jackson leaves MoR to return to her roots in nearby Georgia. Teri Bodley joins MoR as sales and service specialist. Man of Rubber expands retail sales with new website and hundreds more products online. Man of Rubber celebrates 25 years of outfitting outfitters! MoR River Gear enters the second decade of the 21st century with an aliance with MTI, one of the world’s leading manufacturers of life jackets.